From the beginning, while the marquee has been saying “transit“, the players on the stage have been studying their lines in parking. These two threads evolved along parallel tracks. But the project (first called the Fuller Intermodal Transportation Station, or FITS) has always been about parking, at least as currently designed and planned. According to the UM there is a great need for more parking as the medical center grows. But, it is important to note that the parking component at FRS does not represent a net increase in parking spaces for commuters. 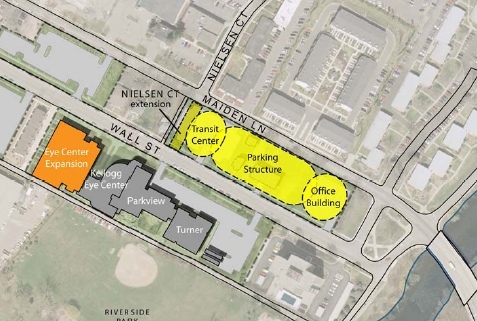 If not for the FRS plan, the UM would now be pushing forward with their plan for two new parking structures on Wall Street along with a new bus terminal. But of course their plan did not include rail infrastructure and more people would still need a bus to get from the new structures to work. Note that the University attempts to provide parking for only 50% of their 40,000 employees. 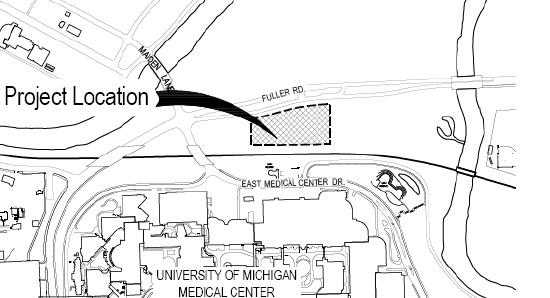 The “Fuller Road Station” is to be located between the UM Medical Center and Fuller Road, with a complex of Huron River, roads, intersections, and railroad tracks surrounding it. 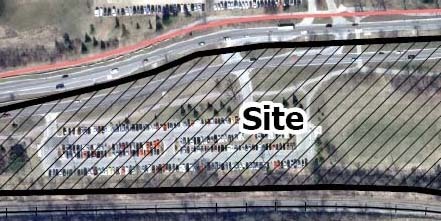 The yellow area is a parking structure that also contains some bus access and bike storage area. The current parking lot (the one that everyone thinks is being replaced by this structure) is still there. There is no train station. The “concept plan” also calls for an eventual train station where the surface parking lot is. But it is not part of the current plans for construction and has not been funded. The idea of some sort of transportation node at this location goes back to the Mayor’s Model for Mobility, 2006 (look at the map). But the impetus for this joint project came from a parking problem. The University of Michigan has been engaging in long-term planning and determined that it needed parking for its growing medical campus. Since the UM had been acquiring property on Wall Street for some time, it planned a parking structure and transit center there, handy to the Maiden Lane exit to Fuller Road. Residents in nearby condominiums naturally objected to this idea. UM held several neighborhood meetings in late 2008. But Mayor Hieftje and others at the city had already seen an opportunity. As described by the Ann Arbor Chronicle, city staff and elected officials met with UM officials and managed to change the subject: how about if we house your parking needs on Fuller Road — and you cooperate with us on a transit center? As early as July 2008, this arrangement was being hinted at in a resolution of cooperation with the UM (sponsored by Mayor Hieftje and CM Sabra Briere). By June 2009 (again, reported by the Chronicle), the UM had put the Wall Street project on hold. And in August 2009, Hank Baier (UM VP for Facilities) had written a letter of intent agreeing that UM and Ann Arbor would work jointly on the “FIT”. But Baier was very clear about what the UM’s interest was. As the conceptual plan for FIT is advancing, city and university staff will continue their efforts to more fully define next steps in anticipation that each of us will approve the conceptual plan in October. That schedule is necessary if we are to reach agreement on a first phase of construction that would accommodate university parking by 2012. It has always been about the parking. See the city’s page on Fuller Road Station for many documents and explanations. UPDATE: Correction: the parking lot shown on the Phase 1 schematic is only part of the existing parking lot. Much of the Fuller Road Station parking structure would be constructed on the site of the existing lot. This aerial view of the current site, kindly supplied by CM Sabra Briere, can be compared with the Phase 1 schematic shown above. Clearly there is a considerable overlap of the structure and the current parking lot. SECOND UPDATE: We were perhaps negligent in not including a link to a recent opinion that UM should not build more parking. Joel Batterman, a graduate student at UM, has been studying the issue. He wrote an opinion piece for AnnArbor.com that also has a link to a much larger study of the issue. THIRD UPDATE: On February 10, 2012, the UM and the City of Ann Arbor announced that the UM will not be participating in the joint parking structure-transit center project. See the accounts by the Ann Arbor Chronicle (which includes a timeline of the project and is adjacent to a series of cartoons with outrageous puns) and AnnArbor.com (which includes a long series of reader comments, none complimentary to the late departed parking structure). Also, see the announcement in the UM Record Update, which includes a link to the formal announcement. Scarcely had the cheering died down before CM Christopher Taylor (who seems to be the Mayor’s chosen surrogate for these tough jobs nowadays) sent out (February 11, 2012) a widely circulated letter to constituents with a firm statement that the Fuller Road Station is still on track, so to speak. Here it is quoted in full by AnnArbor.com. This entry was posted on September 2, 2011 at 6:12 pm and is filed under civic finance, Transportation. You can subscribe via RSS 2.0 feed to this post's comments. You can comment below, or link to this permanent URL from your own site. Federal regulations require that any designated park be considered “protected lands” when evaluating the impact of a federally-funded project. This raises the bar from simply a determination of “no significant impact” on the existing environment, to “no reasonable alternative” to building the project at all. There are reasonable alternatives to the parking structure, from providing alternative transportation and not building it at all, to building it on the vacant lot at Ann and Zina Pitcher. There is also an alternative (and better) location for a future train station–the existing location! By combining this large parking structure with a hoped-for train station–two otherwise very separate and unrelated projects–it makes alternative locations less attractive than if each were considered separately. The JJR report fails to point out the reasonable alternative of separating these projects, then finding other locations for each. Could the higher standard for designated parks be why the JJR environmental report fails to identify the site as being part of Fuller Park (as it has been for about 80 years)? The map in their report labels the site “Fuller Road Parking Lot.” North of Fuller Road, it labels Fuller Pool and Island Park, but no mention whatsoever of Fuller Park. In fact, there is a sign leading into the existing surface lot that says “Fuller Park” and the City’s lease to UM for the surface lot also calls it Fuller Park. But the City’s submission to the feds omits any park references–it simply says that it is zoned “public land.” Why? Ironically, the report rules out certain other parks along the railroad tracks as potential sites, BECAUSE THEY ARE PARKS! Federal regulations also state that any company or person with a financial stake in a project is not eligible to perform the environmental assessment. JJR prepared this environmental assessment and also designed the sewer relocation project–the first step (the REAL Phase One) in preparing the site for the parking structure. Perhaps this is why JJR’s name does not appear on the cover of the report and is instead, buried on page 56. That sewer project was also renamed after bids were taken to remove “Fuller Road Station” from its title when it was brought to Council for a vote. If this is such a beneficial project, why all the apparent subterfuge? Thanks for this excellent summary of the “park question”. I haven’t attempted to deal with it in this particular post because it is a separate thread in this very complex issue. Your point about the problem of combining the transit center (aka train station) and parking for the UM “it makes alternative locations less attractive than if each were considered separately” is particularly salient. Some of these points are also discussed on the opposition website, http://www.protecta2parks.org/home. If they are violating federal regulations, then can’t someone do something about it? Or, are they above federal regulations? I know the Sierra Club and at least one very knowledgeable citizen have written very comprehensive letters to the Federal Railroad Administration, among others, on these issues. The City and UM would not have to be concerned about these special federal regulations if they were not seeking federal funding. This is why they’ve tried to separate or downplay the parking structure aspect (which would not be federally funded, in theory). The City and State are not immune to federal law regardless of funding, but having the involvement of federal agencies and federal funding brings with it a much higher standard of regulation and oversight that would not otherwise be present. So the Mayor is between a rock and a hard place. He either needs to push ahead solely focusing on building a huge parking structure for UM on City parkland (using City and UM money only). That would certainly be a black mark on his environmental and fiscal record and would likely cause near-universal uproar in the community. Or, he needs to continue to call it a train station and seek federal money with all of its regulations and oversight. Choose your metaphor: Tight rope? Double-edged sword? Tangled web? I don’t doubt that there were initially some good intentions at play here–getting the parking structure off of Wall Street (temporarily anyway), improving hospital parking, encouraging alternative transportation, but I’m afraid that this thing has taken on a life of its own. A closed-door decision was made long ago that this was a good idea, and they are trying to stuff it through by any means necessary, piece by piece, refusing to deal directly with any of the many reasonable counter-arguments being made against it. Of the $2.8 million Federal funding for environmental and engineering… only $150,000 is for environmental stuff. i find it odd that they stress the environmental funding, when it’s only a small fraction of the $2.8 million.